janes, dominic 2016. The Wordless Book: The Visual and Material Culture of Evangelism in Victorian Britain. Material Religion, Vol. 12, Issue. 1, p. 26. Dittmar, Jenna M and Mitchell, Piers D 2016. The afterlife of Laurence Sterne (1713–1768): Body snatching, dissection and the role of Cambridge anatomist Charles Collignon. Journal of Medical Biography, Vol. 24, Issue. 4, p. 559. Nieuwenhuis, Ivo 2015. The Power of Satire. Vol. 2, Issue. , p. 217. Molesworth, Jesse 2012. Sterne Studies on the Eve of the Tercentenary. Literature Compass, Vol. 9, Issue. 7, p. 453. 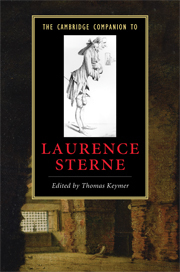 Best known today for the innovative satire and experimental narrative of Tristram Shandy (1759–67), Laurence Sterne was no less famous in his time for A Sentimental Journey (1768) and for his controversial sermons. Sterne spent much of his life as an obscure clergyman in rural Yorkshire. But he brilliantly exploited the sensation achieved with the first instalment of Tristram Shandy to become, by his death in 1768, a fashionable celebrity across Europe. In this Companion, specially commissioned essays by leading scholars provide an authoritative and accessible guide to Sterne's writings in their historical and cultural context. Exploring key issues in his work, including sentimentalism, national identity, gender, print culture and visual culture, as well as his subsequent influence on a range of important literary movements and modes, the book offers a comprehensive new account of Sterne's life and work.